"I was 7 years old when the WASP were disbanded and my aunt Winnie came home from the war. And shortly thereafter, some other WASP came to Miami and they became the part and parcel of our lives...They were extraordinary." 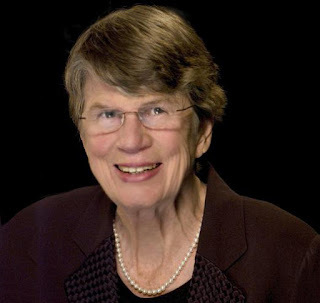 The honorable Janet Reno, former Attorney General of the United States of America, passed away on November 7, 2016, after a long battle with Parkinson's disease. Our gratitude to God for a WASP Champion such as this... Janet Reno -- where honor met integrity in an uncompromising and inspirational way. Where kindness, compassion and humility overshadowed circumstances and challenges. She always did her very best. She always told the truth. The buck always stopped with her. The WASP are proud of her, no matter what her political affiliation. In 1993, Janet Reno came to Avenger Field, Sweetwater, Texas. She came, despite political pressure and controversy, to celebrate the unveiling of a WASP statue at the field where her Aunt Winnie had trained. A statue created by her friend, WASP Dot Lewis. People asked me today out there as the statue was unveiled "What do the WASP mean to you?" Let me tell you. I was 7 years old when the WASP were disbanded and my aunt Winnie came home from the war. And shortly thereafter, some other WASP came to Miami and they became the part and parcel of our lives. We owned them. I owned Dot Swain, Bobby owned Doris G, Margie and Maggie had a fight between Leela Lowder and Carol Bailey and I think Marty got Leela. and Maggie got Caro. But they were extraordinary. I can still see Aunt Winnie coming home in the blue uniform. She was a heroine to me. And then Dot came down and she was Miss Ophelia Jones in the air show. She put a funny hat and old lady stocking shoes and she went out and flew this plane like she learned to fly in this plane. And Kaddy Landry gave me the first plane ride I ever had. And Doris G and Leela. Landry told me about Texas and I never understood what Texas was all about and I still didn't understand particularly after listening to Doris G why Texas was so important. And Kaddy bossed us around, Mildred Caldwell was wonderful to us. And they were extraordinary. Because what they did was...I had the impression when I talked to one of them that I wasn't going to do anything bad, I wasn't going do anything disrespectful. And it was not so much that I was going to get punished if I did except maybe by Kaddy Landry and Doris G would tell me what she thought of me. But more important I didn't want to disappoint them. And then, I read the book, and then I heard the stories all over again. And I thought, I can do that. I can do anything I really want to do as long as its' the right thing to do and I put my mind to it. Because those ladies went and flew planes and for as long as I live. Sometimes in these last two months, as I've dealt with some of the difficult issues, I think of what it was like flying over the donner pass...and she couldn't establish radio contact with Reno and the left engine was beginning to sound rough...and some how or another...the story continues, you can do anything you want to if it's the right thing to do and you put your mind to it. But then I met other people along the way. Suds came to town. Suds looked at me like there's one of those young Reno's my goodness...she like the others -- twinkled -- and even though Caddie Landry said she didn't want anything to do with children she didn't know why anybody had children...they all seemed to love us, Suds included. Then I met my own WASP. Separate and independent from Aunt Winnie's WASPs as I called them. I went to high school and one of my teacher's in high school, Felicia West was a WASP and she taught me ever so much about how to play fair, how to be a good sport, how to loose, and how to pick yourself up and win again and do it the right way. And then I came out to California and Suds and Mary Nelson and Dot Swain and so many others made me feel welcome. That summer and I began to see what the WASP were doing. They were going beyond the dedication to the nation. They were becoming great artists, they were doing things in their community, they were becoming teachers, they were making a difference, they were raising families. I think that's the first summer I saw Chig beginning to grow up instead of just a little baby. Then I went to Cornell and I met another WASP all on my own, only it was with the help of another aunt and that's when I met Dawn Seymour and thought, another heroine. And to those of you who are between the ages of 25 and 30 let me tell you that a seven year old child, about 48 years ago, was touched again and again and again by women 25 to 30...who have made a profound and distinguished difference in my life. But they keep coming back. They never leave. You go out to see your Aunt Winnie and you see Doris G and it's like Doris G never changed and she sounds exactly the same, she's as bossy as ever, she's opinionated as ever, and she still loves Texas even if she lives in California. And Dot Swain doesn't look a day older, and she can still play the guitar and do as she did as she did around the campfires 48 years ago, she can still sing 'Those Brown Eyes". These ladies have taught me ever so much. They have given me strength and understanding. They have reached out and touched me as a child, as a teenager, as a college student, as a young woman, as somebody being mentioned for Attorney General, and in the darkest loneliest days of these last two months, the WASP have been there, every step of the way. Think of what these ladies have been thru, us who are younger who think we face so many challenges. These ladies grew up in a depression. When you took a can of tuna fish and shared it between a family of 5 and made it go... and then shared with some more people along the way...and you don't feel sorry for yourself, you remember those times those extraordinary times when people shared. And you went off to war to help defend a nation against one of the worst tyrants in the history of the World and you remember it with pride and vigor and you remember the fun stories along the way and you remember those you lost with pride and honor. The WASP are not fancy people. You don't go into a WASP house...I haven't been into a WASP house that was that particularly fancy. They just are themselves. They're just real wonderful great honest opinionated people. They went off to serve their country. And think about it...look at our young people today. How many young people to you think would pay their own way to go serve their country and fight for freedom-- the WASP did it . And they serve as an example for all of us, let's go pay our way and fight for freedom. They taught me as I've said that women can do anything they really want to do if it's the right thing to do . They taught me loyalty. Boy these women can get into fights with each other but they always make up. And they taught me about friendship and family and they have interweaved through my family as if they had become a part of it. But most of all I think the WASP had to fly airplanes. They had to get that plane back on the ground. And if they didn't get it back on the ground, the buck stopped with them. And they had to do the right thing in the air and they've done the right thing on the ground ever since, and they've been accountable for it...and they've had...been a remarkable inspiration for so many of us. And now I'd like to challenge you all...the fight is not over. In these last few days and even before, you all have taught me that the next 30 years are going to be a wonderful time... 40 years are going to be a wonderful time....I'm going to grow old and have a throughly good time and fight and care and continue to care about America and never give up, cause you all if you can fly all over this country and do everything that you're doing and be as wonderful and as graceful as you are we got a long time to do some more yet. And I would like you to join me in a challenge. You helped weave the fabric of society around me, my brothers , my sister, you have been a part of our life, our family. But there are an awful lot of children in America who have no family no structure around them. There are babies brought into a world of poverty, of a mother who's not there of a father they've never seen. There are other children with plenty of money in the world who's parents don't give a darn cause they're more interested in material things rather than what's right and what's wonderful in this world. And somehow or another all of America has to join together to reweave the fabric of society around our children who are the future. All of us...the WASP, the attorney's general (ETC) everybody who cares about the future of America have got to reach out and let children know that they're accountable. That if they do something wrong there's gonna be a WASP being disappointed. There's gonna be a Doris G hollering at em...there's gonna be a Kaddie Landry speaking sharply to them, and most of all there's gonna be an Aunt Winnie looking at them very disapprovingly. And if you've ever been looked at by an Aunt Winnie very disapprovingly, you know what that can mean. But if you've ever been looked at by an Aunt Winnie or the WASP with all the love and affection that I've been looked at this day and for the last 50 years, you will know what we have to give our children. And let us join together to remember that the fight is not over and to remember the last two verses from the book of Malachi, "and behold I shall send you the prophet Elijah before the coming of the great and dreadful day of the Lord and he shall return the heart of the father to the children and the children's hearts to their fathers lest I come down and smite the earth with a curse. God bless all of those touched by Janet Reno. Thank you, Madam Attorney General, for your service. Thank you for doing what you thought was best for our country. I am honored to have met you. May your life continue to be an inspiration for the words honor, integrity, patriotism and justice.